It goes without saying that the template you use is of utmost importance when designing a website on Joomla. It isn’t simply about making website aesthetically appealing or impressing your customers with a fancy layout. While a template does significantly decide the look and feel of a site, it also subtly conveys everything you, as an entrepreneur or company, stand for. Now, when it comes to selecting templates, the general notion is that only the premium ones are any good, especially if you are a serious businessman. Your website is too important a component of your business to be entrusted to a theme that a developer doesn’t care to charge a price for. After all, whoever heard of setting up a fully-functional, professional looking website that runs on a freebie? Well, surprise, surprise! That isn’t entirely true. There are plenty of free Joomla templates that can rival even the premium ones in their design, look, and features. Here are the top 10 free Joomla templates that are not just absolutely stunning to look at, but come packed with a wide range of features. Once you are done taking a look at them, I doubt you will hold on to the initial skepticism you harbored against free templates. 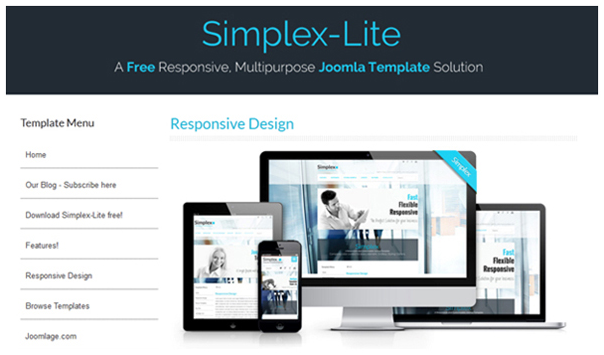 Simplex-Lite is a responsive template that makes for a great choice regardless of the scale of project you’ve undertaken. Whether you have a full-blown commercial site or are dealing with something very basic and personal, Simplex-Lite, with its one click features, delivers beautifully. By giving you absolute control over every aspect of the template’s design – the header, menus, base, top and bottom modules, footer copyright, slideshow, etc. – it allows you to create almost any look that you want. And the best part is you can even control the theme’s responsive option. When you turn it off, the site will look the same on all devices and when it’s on, the layout will change according to the device. The goodies don’t end here by any means. Oculus is based on Gantry 4 – a robust core framework that lends power and stability to the template. Finally, with RokSprocket – a fabulous new extension designed for Joomla – you have a much greater control over how the content is presented. 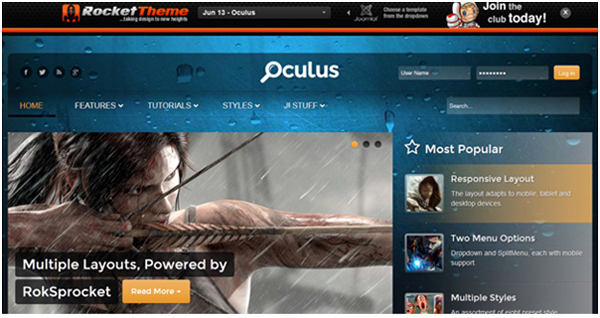 All in all, Oculus is an extremely desirable template that scores high on not just aesthetics but functionality as well. I like the MUSIC theme! best for me.